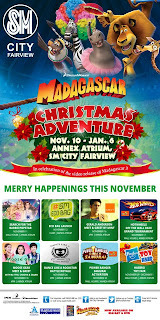 Catch Blythe, Chacha and Zaijan on November 18, 2012 (that's tomorrow, Sunday) for the fashion show of Moose Gear and Moose Girl Apparel and chance to meet and greet with them. This will happen at 4pm. Catch the dancers as Dance Like a Rockstar will have its Battle Royale this coming 24th of November 2012 at 2pm. The Power Rangers Super Samurai will be on its way to SM City Fairview as they will be having its powers activated on November 25th from 10am-9pm which is the Mall Hours of SM City Fairview. Lastly, Hasbro will be having its 3-Day Toy Fair Sale on November 29, 2012-December 1, 2012 from 10am-9pm. So, what are you waiting for? 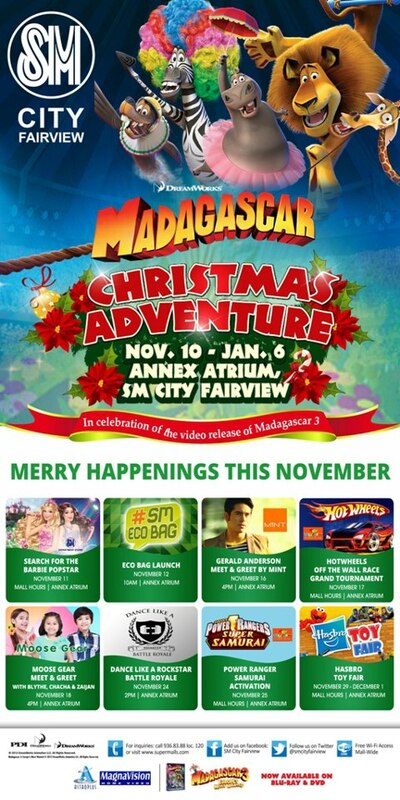 Don't be the last one to miss out on the events that will be sponsored by SM City Fairview and its partners. So, be merry at SM City Fairview. After watching all of the events or shopping for the Toy Fair, don't forget to visit the Christmas Adventure display found also at the Annex Atrium.